PORTLAND -- In what is likely to be the final major hearing before a federal judge decides what must be done to make Columbia River dams safe for salmon, lawyers argued Monday over just how many salmon have to come back and whether that satisfies the Endangered Species Act. U.S. District Court Judge James Redden previously shot down two Bush administration plans for restoring salmon runs and is considering whether minor improvements offered by the Obama administration giving biologists more flexibility to react to problems are enough to make the plan work. The battle comes down to a choice between cheap, abundant power provided by hydroelectric dams on the Columbia and Snake rivers, and the many salmon the dams kill as the young fish migrate to the ocean and swim upstream as adults to spawn. 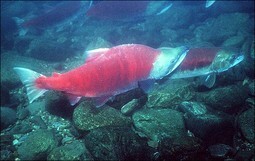 Conservationists argue that the current plan sets too low a bar for salmon survival.